Info: This feature requires Content Station 10.8 or higher. The Content Station Desktop app is used for setting up the communication between Content Station and other applications and for controlling some of the features of the Desktop app itself. Note: Shown here is the Desktop Application version 1.x.x (available since Content Station 10.28). Older versions will contain less options. For opening layouts in InDesign: Content Station 10.15 or higher. For choosing the editor in which to open articles: Content Station 10.8 or higher. For connecting to Enterprise Server through a proxy server: Content Station 10.16 or higher. 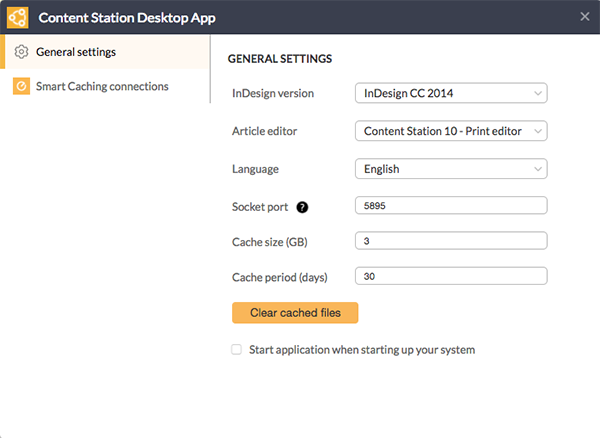 For automatically downloading a file when it is routed to a user (Smart Caching): Content Station 10.28 or higher. Note: Content Station 10 or Google Chrome is not needed for using Smart Caching with Smart Connection. Step 1. Download the file named Content Station Desktop App 1.x.x-bx from the Release announcement of Content Station 10, unpack it and double-click the file it contains. On Mac OS X: In the installation window that appears, drag the Content Station Desktop app to the Applications folder. On Windows: Run the installer and wait for it to complete. 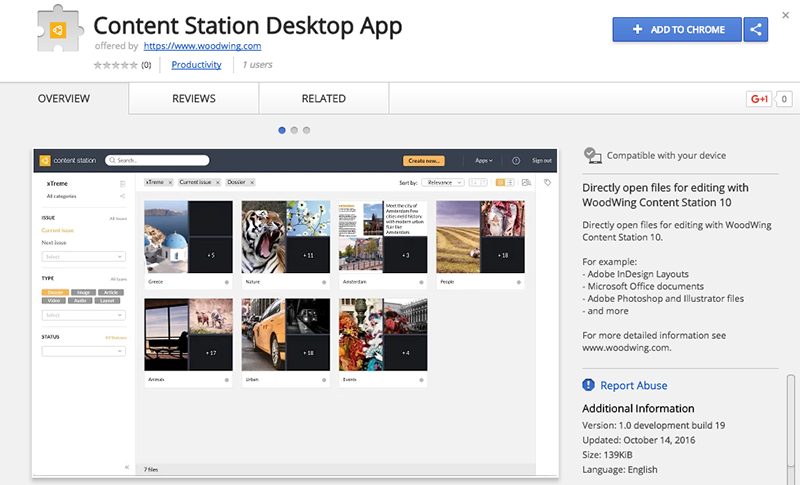 The Google Chrome extension is installed by launching the Content Station Desktop app. On Mac OS X: Run the application from the Applications folder. On Windows: Run the application from the Desktop shortcut or the Start menu. Figure: The extension for the Content Station Desktop app in the Chrome Web store. Step 2. Click Add to Chrome and confirm that you want to add it. The extension is added to Chrome and appears in the toolbar. Figure: The extension added to Chrome. Access the Desktop app by clicking the Desktop app icon in the menu bar (Mac OS X) or in the system tray (Windows). Note: When an old version of the Desktop app is installed, the Settings window will appear immediately after clicking the icon. To use the Content Station Desktop app, it needs to be set up. This is done through the Settings window. (Optional) Set the socket port through which the communication between the Chrome extension and the Desktop app should take place. When in doubt which port to use (if any), contact your system administrator. Note: You can also set this by clicking the Chrome extension icon in Chrome. (Optional) Set the socket port through which the communication between Smart Connection and the Desktop app should take place. When in doubt which port to use (if any), contact your system administrator. Files that are downloaded by the Desktop app when they are opened for editing and do not yet exist on the system. Files that are downloaded by the Desktop app when they are routed to you (see Smart Caching). (Optional but recommended) Define that the Desktop App should be launched on system start-up (this is the default setting). Info: This feature requires the Desktop app version 2.0.0 build 24 or higher. Smart Caching makes it possible to automatically download a file to a user's system when the file is routed to that user. 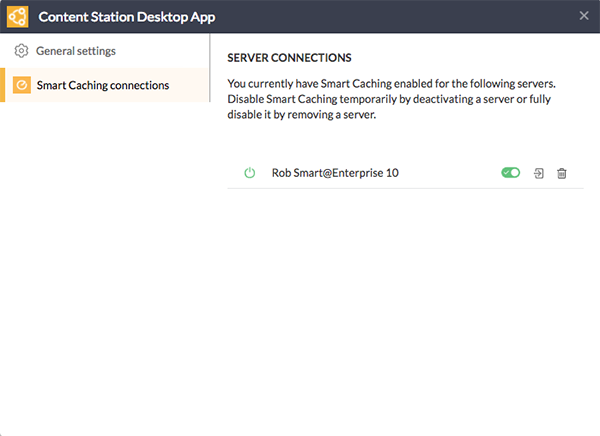 The Smart Caching connections window shows all instances of Enterprise Server to which a connection has been made for Smart Caching (by logging in when first using Smart Caching). The settings allow you to enable or disable Smart Caching, disconnect or re-connect from an instance of Enterprise Server, or remove the Enterprise Server instance completely. For more information, see Automatically downloading a routed file in Content Station 10. (Optional, only when a proxy server is used for connecting to Enterprise Server) Set the proxy settings as described in Connecting the Content Station 10 Desktop app to Enterprise Server through a proxy server. 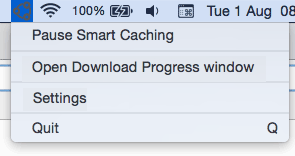 18 September 2017: Added information about using Smart Caching with Smart Connection for Adobe CC 2014. 10 August 2017: Added information about using Smart Caching. 10 August 2017: Added information about the options window. 9 August 2017: Added information about the Desktop app menu. 21 February 2017: Added information about setting the proxy settings.